When Paul and Michelle each tried on their new pair of shorts, I was stoked and then some. You see, they’re my first sewing students. I’m still not sure how my Repair Cafe team decided I could teach sewing, but they did. Paul wanted to learn and so did Michelle. Now, there aren’t pictures of them because I was so excited, the photos turned out all blurry. Argh. But the best part of the sewing lessons is that the group, over the past year, has expanded and this is wonderful. For years, I was about the only person I knew who made her own clothes. Or wanted to sew with other people. 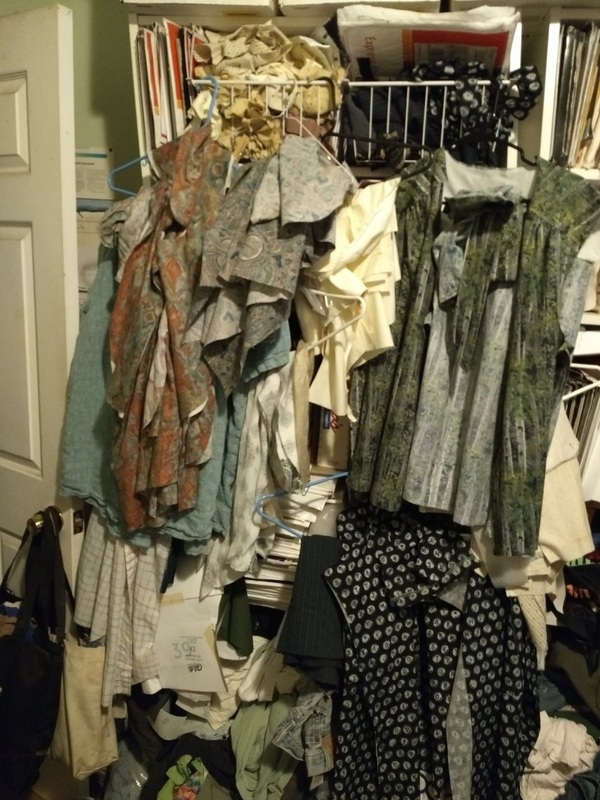 A couple years ago, two other friends, Hilary and Elizabeth, thought it would be fun to get together to sew, and we managed about three days spread over a year or so. The problem was, we didn’t keep it up, nor did we set a regular time to meet. Well, I made a point of doing that this time. Between my two students, I’ve got about five other ladies (I do wish we could get more guys interested), who regularly show up and we’re building some really good friendships. We’re meeting about once a month. I’m sewing more, too, although not on meeting days. I’m too busy supervising. But on other weekends, I’m hitting the machine. That mess in the photo? I’ve started assembly-lining again – which is cutting out a boatload of projects and working on them all at the same time. More time may elapse between start to finish, but the time per item is remarkably reduced. This is will never be a how-to blog. But I do like sharing what I’m currently working on. And right now, I’m working on teaching two people how to sew. Who knew?